A couple months ago the Trini Gourmet posted about her forays into making Trinidad Kachourie, a fried delicacy from the Indo-Trini background, available wherever doubles and sahinas and baiganis are sold. 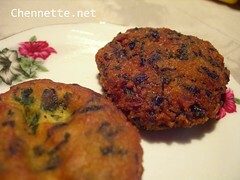 Trini Kachourie is a like a fritter made from ground yellow split-peas (or our dhal) or even chick peas, and seasoned with the usual suspects of geera (cumin), garlic, hot pepper, shadon beni (bandhania) and sive (chives). 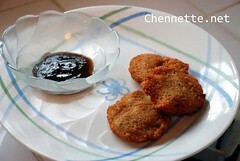 All ingredients are mixed together and deep fried till brown and crispy. As Trini Gourment discovered for us all, that Kachouries in T&T aren’t the same thing that is so called in India, the latter version being more like a stuffed fritter where it is sometimes stuffed with the same ingredients as are in our kachourie, and wrapped in a flour shell, or in the Uttar Pradesh version somewhat like Trini aloo pie! TG also experimented with using Phoulourie Mix to make quick kachouries, since the base of pholourie (and at least in the packaged mix) is split-pea flour, which resulted in a doughy kachourie, perhaps a little to light on the split-pea taste. She also posted the Naparima Cookbook recipe which uses ground peas for the kachourie, which is what got me to thinking about kachourie and my experiences with it (and no, I am not going to just recant Sarina’s post here Go read it!). You see, I grew up with Mom-made kachouries, which, like Mom-made baras, were more substantial than the street-food version. And Mom’s kachouries were more like the Naparima cookbook version, which makes for a crunchy textured delicious kachourie. I never even thought of kachourie as being anything like pholourie at all, and while I am not disagreeing with TG, kachouries for me always meant ground soaked-overnight-split-peas until I ate them outside. 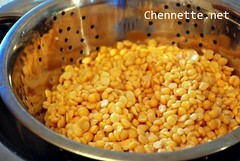 For there are indeed different versions and textures of kachourie, some of them clearly being made from the split pea flour rather than the peas themselves, and thus resulting in the fluffy inside, crispy-on-the-outside kachouries that call for curry-channa-stuffing. There is the same side-by-side existence of crunchy vs fluffy sahina in Trinidad, based on the same choices for base ingredient. I remember enjoying the 2 types of sahinas simultaneously last year for Divali in Trinidad as different neighbours dropped them off. You can see the different textures in the photo and guess what the kachourie textures might be (maybe I’ll post later on sahina). Of course all this thinking, especially during Ramadan (already over I know, I am behind as usual), made me want to make kachouries. I had lots of dhal (yellow split peas) and time. I soaked the dhal, perhaps not overnight, but long enough for the moment and began. Grind, grind, grind in the food processor (or should that be “process, process, process”? ), then add a combination of eschallots (Guyana term, approximates Trini chives), bandhania, pepper (sauce), garlic, ground coriander (dhania) etc. Then there’s the addition of some flour and baking powder. Now, of course I was not without my own desire to experiment. Since the Naps cookbook suggests split peas OR channa (chick peas) and falafel is made from ground chick peas (or sometimes lentils if you have Syrian or Lebanese connections), so I wondered what ground split-peas would taste like falafel style. That would be, ground peas, well seasoned and herbed, and fried without the addition of flour, baking powder and water. So I tried it for the first few. The texture was dense and moist, not as crunchy, and had a really strong pea-flavour. Much stronger and greener than chick peas. I don’t think yellow split peas make for a good falafel, although the texture was very much similar. That taste needs a bit thinning out. Experimentation shelved, I proceeded to add some regular old white flour, baking powder and some water, to loosen up and lighten the kachourie mixture. And voila, when pressed into patties and fried, it was crunchy all over, and nicely textured, with the crispy bits at the flattened edges. Yum. Of course, this one cannot be easily stuffed with curry channa, but it CAN be dipped into your favourite chutney (tamarind used here) or sliced and slathered with the stuff. Your choice. Snap photos as best as you can in late evening light, drive over to sister the elder in time to break fast and you’re good to go. Well, last bit optional, until next Ramadan. It was interesting to realise that kachourie isn’t really known in Guyana, considering the number of similarities when it comes to our respective Indian heritage cuisine. Particularly as I have realised from Cynthia’s comments here and elsewhere, there are even more similarities in those foods, especially the traditional home-cooked versions, than I ever knew. But maybe their kachouries are even more traditional – if you count egg balls and related stuffed and fried items on the Guyanese menu. What do you think? ENJOY! And as always, experiment. This entry was written by Chennette and posted on November 10, 2007 at 12:52 pm and filed under food, Ramadan, recipes, Trinidad and Tobago. Bookmark the permalink. Follow any comments here with the RSS feed for this post. Post a comment or leave a trackback: Trackback URL. Looks yummy… I remember my Mom making this a lot when I was growing up… especially Eid Day… it was just shaped into small sized balls. Same recipe …soaking the Dhal then grind it, back then it was the masala brick, no processors. I am Muslim Guyanese in NY. Thank you for bringing back wonderful memories. I’m definitely going to try this. Thanks for your notes and thoughts on it. Hi Zee – we used to use the mill to grind. But food processors are great tools! Thanks for your comment and memories. Cynthia, looking forward to hearing how it came out. Sahina and Baggia are two different things even though we seldom differentiate in good old trini……..
Lilandra and her female siblings love sahina but brother prefers baggia………..
Love reading your trini recipe blogs! They really do bring back the memories. My dad had Kachouries for lunch on Friday (in Trinidad) and he offered me a piece. I declined and now that I am back in Canada, your description of it makes me wish I had eaten some! Any chance of a jalebi recipe? I would suggest Debe but since you’re in the cold North, Indian jalebis aren’t that bad. And some of them are not as sweet as ours, making them more enjoyable! 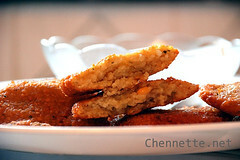 My “Mama” would punch a hole in a ghee tin, pour the batter in and use it to direct the swirls of batter into the oil. I remember her doing it, but I was only 10yrs or so at the time. I was more interested in eating the finished product! see, you better than me – I never even see it done! Ramadan mubarak. Thanks for sharing this because my umm recently brought this with her along with doubles and sahina and non of us know what the name of it was; all we know is we ate it before many times. And now that i saw the pic i was like or that is what they call it….even the name does not sound too familiar :)…i blame it on Laventille…. assalamu ‘alaikum Umar – Ramadan Kareem! it’s pronounced usually like ka-chaw-ree – does that sound more familiar? anyway, glad to help out! Hope Ramadan treating you well. Rounded & fluff interiors /insides enhances kachourie taste. Beautiful Sugarcane blooms reminiscent of wonderful grandparents & their cuisine.